Ralphie: I’d pick Luck. First of all, I like his name, but second, I just think he’s the better player. Brad: Probably Luck. I like his playing style, and I think he is the stronger, more reliable player. Joe: Andrew Luck will be just another rookie QB in the NFL this year. Remember, for all practical purposes, Peyton Manning was the QB, play-caller, offensive coordinator and whatever else he wanted to be. New QB, new coach, new coordinator spells mediocre team. Future depends on meshing all of the variables. Brad: I think Luck looks like he could be a strong player and quarterback. He has a solid record as a college player, and I expect to see even better records as a Colt. Ralphie: I expect Luck to have a good year. The team isn’t very good, but I think he’ll do a good job for them. I think he will have a very successful career. I really think he’ll end up being a superstar. Joe: I like Luck's chances for success . . . he talks like Peyton Manning. 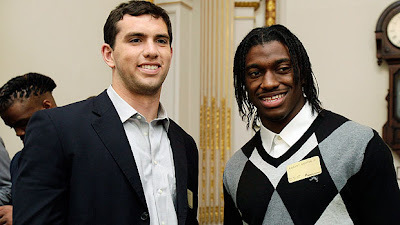 Chris: Indianapolis sock stores are very disappointed the Colts didn’t draft Robert Griffin III. In fact, with Griffin leaving Waco, there have already been five sock stores file for bankruptcy. Ralphie: I think he’ll do a pretty good job this year, but I don’t think his career is going to be all that great. I think he’ll kind of disappear after a while. Brad: I think Griffin is a good team player and a strong runner, and I think the Redskins can rely on him to pull his weight and take the Redskins far. Joe: RGIII comes into established coach, system and coordinators. If he adapts quickly, a lot of upside for Skins. If not, another mediocre team. As with Colts, future depends on the mesh. Chris: I hear Griffin is a fan of mesh. Yo quiero calcetins. I’ve only been to Washington D.C. once, and that was when I was in elementary school. Unfortunately, I only had time for tours of the Smithsonian and certain monuments and was unable to get a grasp on the city’s sock market. Brad: Luck definitely has an upper hand going in as a solid quarterback and as a first round pick. Ralphie: I think Luck will be the one who has a great career. I’m going to start collecting his football cards next year because I think they’ll be worth a lot of money one day. Brad: At the same time, I feel Luck is going to have a harder time stepping into the quarterback position in Indianapolis after Manning’s popularity and sudden firing. Joe: Luck's situation is tougher simply because there is no underlying support system already in place. Everybody is starting on Page 1. Chris: As of tonight Luck’s competitors in his own division include Blaine Gabbert, Jake Locker and Matt Schaub, also known as a lucky draw. Griffin’s division includes Eli Manning, Michael Vick and Tony Romo. However, Redskins coach Mike Shanahan can make things easier on Griffin by surrounding him with an abundance of receivers, running backs, linemen and natural cotton blend stockings. Ralphie: I think Luck has the tougher situation because the team isn’t very good. That’s going to make it harder for him to stand out and have people see what a good year he’s having. Joe: I would look further down the list of QBs before jumping so quickly on the Luck-Griffin tour bus. Remember a guy named Brady--sixth round in 2000. A real diamond in the rough.